July is National Parks & Recreation Month, and all month long LAist will be featuring a hand-selected park a day to showcase just a few of the wonderful recreation spaces—big or small—in the Los Angeles area. 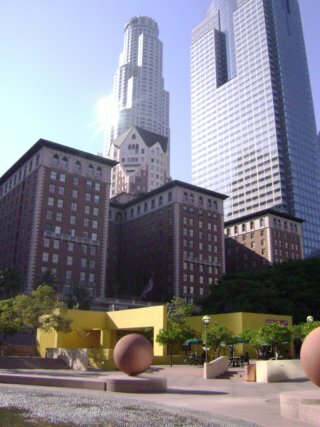 Pershing Square, located in downtown Los Angeles, may be the closest thing Angelenos have to a city center. The park may only encompass a mere city block, bounded by fifth and sixth streets to the north and south, and Olive and Hill to the west and east, but it is one of the few green spaces in downtown. Literally part of the city’s first settlement, as long as Los Angeles has survived, so too has this park. 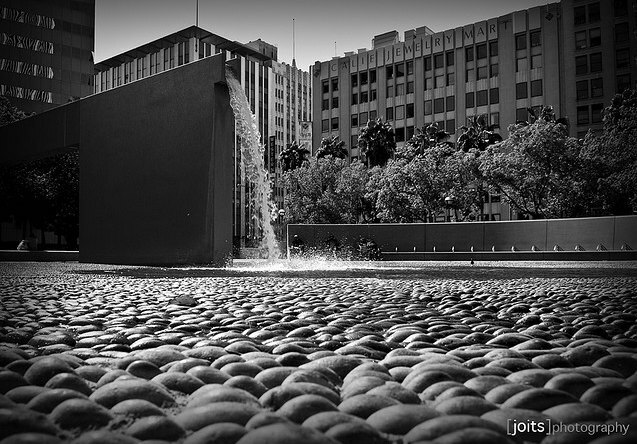 Los Angeles literally grew up around the square. The area has always seemed to attract development, first as a tent camp in the 1850s, and later as a traditional Spanish plaza after 1866. Undergoing several name changes in the next few years, including Sixth Street, Los Angeles, or Central Park, the space hosted speakers and musicians, as well as numerous pleasure seekers. In 1911, the park was renovated by famed architect John Parkinson, who added a fountain. 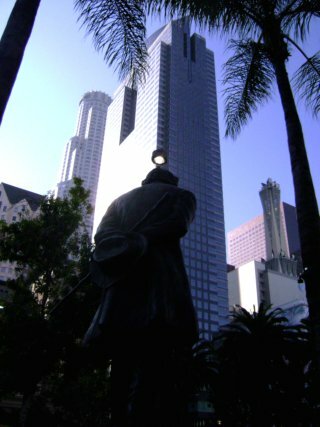 With the end of World War I in 1918, LA renamed the park for the final time after military hero John Pershing: Pershing Square. Yet during the intervening decades, as more residents moved to the suburbs, and the park was eviscerated to build an underground parking lot, the square fell into disrepair. Yet with the help of a renovation in the 1990s, and an uptick in urban renewal, the park is on a comeback. There is a farmers&apos; market on Wednesdays, a concert series during the summer (10,000 Maniacs play tonight with the Sultans of Mambo), and ice skating during the winter. Many downtown residents relax by the fountain at the south of the park, or take in the sculptures by the park’s eastern edge. There is a still a robust transient population, but they happily share the park with dog-walkers and the occasional tourist. On the Sunday afternoon I visited, the park was quiet. This was the first time my girlfriend, a native Angeleno, had been to the park—like many, she was warned of its danger early and often. Yet this danger did not seem to faze the men resting by the side of the fountain, or the neighbors walking their dogs. Whether loved or reviled, embraced or neglected, like the city itself, this park has stayed put pretty well.